The recent spate of hurricanes hitting Houston, the Western part of the Florida peninsula and Puerto Rico have given many of us an opportunity to rethink our prepping plans. That’s as it should be, as we should always be looking to improve, and one of the best tools we have for that is to analyze the disasters that happen, looking for lessons to be learned. I’ve lived through hurricanes before, as my home is in a hurricane zone, but never as severe as these three have been. More than anything, the big difference that I noticed from these three hurricanes, was the amount of flooding they caused. That made the ones I lived through seem rather minor indeed. What these hurricanes made me rethink was, not surprisingly, my stockpile. But not what’s in it, rather how protected is it from damage. Major flooding was not part of my thinking, when I was working out what to store and where to store it. Considering that I live in a hurricane zone, I decided that maybe I need to rethink it. I have to wonder is any preppers living in Puerto Rico, Florida and the part of Houston that got flooded are really much better off than their neighbors, especially the people of Puerto Rico. While many homes in Puerto Rico are made of cement block, which is pretty much impervious to flooding, the poorer people make their homes of whatever they can. So many of those homes might be made of much less substantive material. Of course, the people who own those homes probably aren’t preppers anyway. The reason that I bring this point up, is that the average American home doesn’t stand up well to flooding either. The people who live in the parts of Houston which flooded are left with the need to largely rebuild their homes, as well as replace just about everything that was on the ground floor. For most of us, this would probably also mean replacing most of our prepping stockpile, especially if we stored it in the basement. Anything left there would certainly be waterlogged after the home flooded. When I first started thinking about this, one of the first things I realized is that not all waterproofing is the same. Let me explain. Our homes are waterproofed or maybe I should say water resistant, at least from rain. But they are not waterproofed from flooding. They are only water resistant to water falling from the sky. So, when we talk waterproofing, we need to make sure that we understand what we’re talking about. Basically, there are two different types of water we need to concern ourselves with, both of which can come from a hurricane or storm. One is water falling down, or rain, and the other is water coming up, or flooding. That one has to include the storm surge that a hurricane can cause too. Waterproof – You can submerge it in water and it won’t be damaged. Think a sealed can of food. Water resistant – Water can fall on it and it won’t be damaged, as long as the water flows off of it. But, if it is submerged in water, even partially, it will be damaged. Think a roll of TP, wrapped tightly in a plastic bag. Floating – The item itself isn’t waterproof or water resistant, nor is its container, but it will float, without the water being able to soak in. Think supplies in a plastic storage bin. Out of the water’s reach – The item is stored inside a building, so the rain can’t get to it, but high enough off the ground that the flood waters can’t get to it either. Think something sitting in the attic of a two-story home, but only the first story floods. Our efforts to protect our stockpiles from the water can consist of a combination of these different strategies, depending on the particular item and where we are going to store it in our home. Items stored in the attic might only need to be water resistant or in floating containers, especially since they are probably out of the water’s reach. But items stored in the basement probably have to be waterproof, as any flooding will flood the basement first, so even if it is water resistant or in floating containers, it won’t do any good. Now that we’ve established our ground rules, let’s start looking at some specific items. We’ll start with food, because that is the biggest part of any of our stockpiles. Fortunately, the way we package food for long-term storage gives us a great head start. Much of the food that we buy at the local supermarket is not packed in a way that makes it waterproof, so we repack it for our stockpiles. One of the few things that is truly waterproof is canned goods. Other than the risk of the can rusting through, there is little that can happen to a can to allow water into it. The problem comes in with dry foods, which make up the bulk of our food stockpiles. Since these foods do not typically come in airproof and insect proof packaging, we typically repack them in five gallon buckets, lined with aluminized Mylar bags. In this process of trying to protect it from bacteria, insects, rodents and oxygen. In the process, we also make it waterproof. The bigger problem with our food is that these waterproof containers could actually float off, if our home becomes damaged severely enough to allow it. That may not seem like much of an issue to you, but if you look at photos taken of the results of floods, you’ll see a lot of stuff scattered around, some of that stuff is a whole lot bigger than buckets of food. I distinctly remember seeing video of cars and whole buildings floating away during the tsunami that hit Japan. So, how can we solve this? Simply by anchoring our buckets of food in a way that won’t allow them to float off. That can be done by running a chain through their handles and anchoring it to the walls of your basement, or by making your storage room into a cage that will remain intact, even if your home becomes destroyed. Another way of protecting your food from floating off is to bury some of it. Five gallon buckets are ideal for burying food, as there’s nothing that will decompose or become damaged by contact with dirt and water, other than the wire handle. But plastic handled buckets won’t even have this problem. The bigger problem isn’t waterproofing your food stockpile, but everything else that you have stockpiled. While some of that might also be in five gallon buckets, which would make it waterproof, most probably isn’t, leaving it vulnerable to damage. Solving this problem can be extremely challenging, mostly due to the vast volume of other supplies that you might have. In many cases, rather than actually waterproofing the items, you may be able to give it adequate protection, by utilizing one of the other levels. Take a wood pile, for example. Buying enough waterproof containers to keep your firewood safe from flooding is a big unrealistic. There are few containers that are large enough for more than a few pieces of wood, so it would take an awful lot of container to fully protect your entire stock of firewood. However, chances are that it wouldn’t really need that level of protection. 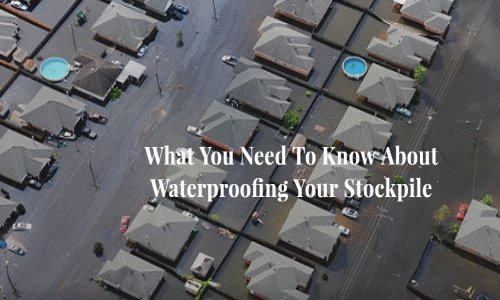 Before waterproofing anything, you need to determine what level of flooding you are going to protect yourself from. That depends on a combination of the types of floods your area is potentially subject to, and where in your home any particular item in your stockpile will be stored. If you live near the ocean, where you might have to deal with the storm surge from a hurricane or a tsunami, then you need to consider the highest level that could reach. If you live inland, any flooding you are likely to encounter would be by an overflowing lake or river. How high the water level would be from that depends on the amount of rain falling and the terrain. Actually, terrain is a very important factor, no matter where you live and what sort of flooding you might be subject to. So as part of your prepping, you need to get topographical maps of your area, including any bodies of water which might cause flooding. From those maps, you can see how high the water would have to rise, before it could get to your home, how much lower-lying land would have to flood first, and hopefully make some determination of some signs that would give you warning about potential flooding. Technically, your home is flooded if any water running across the ground can get into it. One inch of water is still flooding, just like 20 feet of it is. It’s just that 20 feet of flooding can do more damage. The other factor to consider, as I mentioned, is where the item is to be stored in your home. Items that are stored in the attic may not need to be waterproofed, simply water resistant, because they won’t be submerged in water. If your roof becomes damaged, those items may get rained on, but chances are they won’t be submerged. If they are, it would mean that your home was totally destroyed and you probably wouldn’t be able to find those items anyway. People who have a basement tend to put their stockpiles there. I agree from the viewpoint of food, as food is already going to be packed in waterproof containers. Therefore, it will survive any level of flooding you are likely to encounter. But not all your food should be stored in your basement, simply because it will also be the part of your home which retains water the longest. So, you might be in your home and needing to make repairs, but unable to get to your food supply. A few buckets of food, stored in a closet or laundry room could make all the difference in that situation. If you own a two-story home, you have an advantage over those who only have a one-story home. I have seen many flood situations where the first story of the homes is flooded almost up to the ceiling, but the second story is dry. If there is enough advance notice of the pending flood, furniture and other items can be moved from the first floor to the second, in order to protect them from damage. This advantage also works for your prepping stockpile. The buckets of food that I was just talking about keeping out of the basement can most effectively be stored on the second floor of the home, protecting them from flooding, while keeping them accessible. I store a fair number of supplies in my attic, although I do not store food there. Anything stored in the attic has to be more of less impervious to heat, and food isn’t. However, many other supplies are. In this case, the supplies can be made water resistant, rather than waterproofed. My wife has put in a good stock of toilet paper, enough to last us over a year, even if our kids come back home. That is left in its original plastic packaging and then placed in large plastic trash bags (55 gallon bags), which are sealed with packing tape. While this is not fully waterproofed, it is highly water resistant and will float. Until the water attacked the tape for long enough to destroy the adhesive, it is essentially waterproof. Most of the other items we have stored in the attic are stored in plastic storage bins. These also have the lids held on by packing tape, but not to make them waterproof, but rather to keep the kids from coming off. As these bins will float (we get rid of ones that are cracked or have holes in them), everything stored in them is fairly water resistant, unless the house is totally underwater, preventing the bins from floating. Keep in mind that there are limits to what you are going to be able to do. One of my big concerns is my workshop, which is in my garage. There is no realistic way of keeping my tools in waterproof containers, as I use them regularly. All I can hope is that the doors of the garage aren’t breached and that my tools will all be there when everything is said and done. Another area that is limited is bulk storage of things like firewood. There is just no practical way of storing large amounts of firewood in a way that is waterproof. The best that you can hope for is that the flooding isn’t so bad that it floats the wood out of the storage racks. As long as the wood stays there, it can be dried out and used, after the flooding is over. Hopefully, the top of the wood pile won’t get wet, so will be usable. Now you should be able to fix the way you keep your stockpile so you and your family would stay safe. But if you lose it, would be able to survive without it? Would you like to know how the first settlers preserved their food? Then you really need this amazing book. It is called The Lost Ways and it contains all the knowledge of our forefathers. This is great advice. What is the point of working so hard for our stockpiles if they aren’t fully protected from the elements? We cannot accurately predict how much water, if any, that we might get during a disaster. But, you provide very useful tips to be cognizant of while making waterproofing decisions. Thank you for the insight!